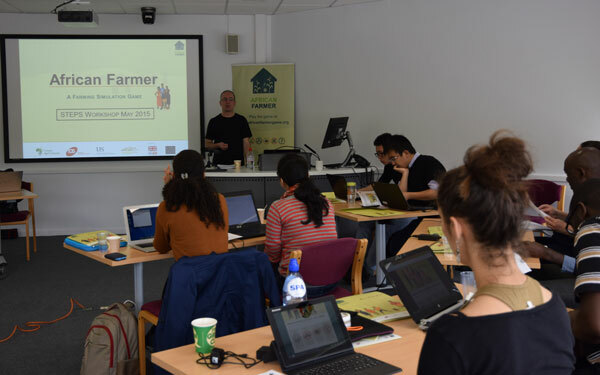 On Sunday, the 17th of May, a major update of the single player version of the African Farmer Game was given its first public outing at a workshop run for doctoral and post doc students attending the STEPS Summer School at IDS. The African Farmer Game immerses players in a simulation where they must confront the challenges and uncertainties of life as a poor farmer in Sub-Saharan Africa. The original single player version of African Farmer was launched in 2014 to complement the multiplayer game. It was developed to provide a more readily accessible version of the game to individuals and institutions for whom running the multiplayer game is problematic. Playing the single player game does not require network access or technical expertise; it can be used in time constrained contexts and the level of complexity and challenge can be increased by the player as his or her expertise grows. This latest iteration of the game, which will soon be released as version 2.0, introduces major updates to the user interface and many improvements throughout the game. The interfaces for Task Management, the Market, the Village and Game Statistics have all been redesigned and all dropdown menus have been replaced by ‘drag and drop’ or ‘point and click’ selections. There are also numerous other minor changes to the user interface. The ‘Chance Events’ module has been expanded to include election bribes and granary fires and town work now brings greater rewards for educated household members. Game Statistics data has also been expanded and can be saved to file for post-game review. The new version of the single player game includes five contrasting configurations of households in a single village of ten households, each with varying amounts of land, labour and working capital. This increases the amount of inter-household social and economic differentiation that exists in the village and means that some households start off as being relatively ‘asset rich’ while others are more ‘asset poor’. In the STEPS workshop players were thrown in at the deep end in terms of game complexity. The game options were set to support six different crops, animal traction, post-harvest losses and ‘chance events’ were enabled, adding to the uncertainties of weather, crop disease and ill health. The students were asked to play the game in pairs, jointly making decisions on farm management, resource allocation and food security as households associated with one of the randomly assigned configurations. This approach worked remarkably well, as it allowed each pairing to play the game on a single laptop and encouraged them to work together to plan, implement and monitor their strategies. Although not a full substitute for the multiplayer version, we were impressed by the level of interaction and the quality of discussions that this simple innovation stimulated in the group. The students found playing the game in pairs an excellent, but challenging approach, as they had to negotiate all major decisions about their farm and household with their partner. When disagreements arose about which tactic or strategy to pursue, tensions would arise as they might in an actual family setting. We had expected the increased social differentiation in this new version of African Farmer to give the wealthier households an increased resilience to certain shocks and stresses, and indeed that pattern did emerge as the students played the game. However all households struggled to handle the array of difficult trade-offs and complex decisions that had to be made over the seasonal and annual cycles. During the debriefing at the end of the session, these observations led to a fascinating discussion based on recent research findings on how scarcity and poverty inhibits cognitive function (Mani, et al. 2013; Mullainathan and Shafir 2013). That work reveals how being poor means coping not just with a shortfall of money, but also with a concurrent shortfall of cognitive resources. Poor people, in this view, are less capable not because of inherent traits, but because the very context of poverty impedes cognitive capacity. Put bluntly, the problem is not with people, but with the situations in which people become trapped. In the game the players were forced to make hard choices, often under considerable duress (e.g. at a time when crops were failing, the money was running out and family members were sick, malnourished or dying). In these stressful situations, they were sometimes blind to alternative options, or they made rash decisions that led to a further deterioration in their situation, locking them in a poverty trap from which they were unable to escape. The good news is that this was not the universal experience. 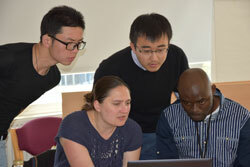 We were pleasantly surprised to observe that after more than three hours of intensive gameplay some poorer households were able to improve their wellbeing through a combination of careful decision-making, calculated risk-taking and good fortune, while some wealthier households ran into problems as a result of poor planning or plain bad luck. Nonetheless, the experience left us all in no doubt that the life of a small farmer can be extremely challenging and demands difficult decisions and painful compromises. “Really helpful to understand the situation the farmers face. We are very grateful to the STEPS Summer School students for their help in testing this latest version of the game. Their feedback has been invaluable and we are planning further code changes and several bug fixes before version 2.0 is publicly released in mid-2015. Their suggestions for more substantial development work to the game will be seriously considered for future releases. Mullainathan, S. and E. Shafir. Scarcity: Why Having Too Little Means So Much. London: Allen Lane.